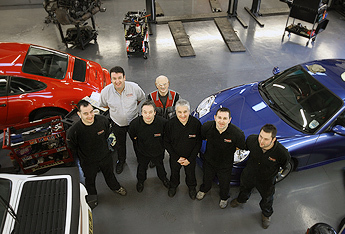 The Team Behind The North's Leading Independent Porsche Specialist. Founded in 1994 by Dave Sunderland, Mark Pendleton and David Forrest, Strasse is now firmly established as one of the country's leading independent Porsche specialists. The three founding partners were fuelled by a desire to do things a little differently and a lot better and with one common goal a passion for Porsche. In that respect nothing has changed and all the Strasse technicians and colleagues all share that same passion. Unrivalled experience and a combined Porsche experience of over 150 years - both with main dealers and here at Strasse. So whatever your passion, 356, to current model, we actually do have what we think is a technical wealth of experience which is unmatched, we know our Porsches, inside, outside and underneath! Strasse began life as a service repair garage but has over years, been able to gently expand whilst retaining real friendliness and customer contact, we offer Pre-Owned Sales in a separate dedicated building, as well as service and maintenance work, engine and gearbox rebuilds, full body shop and restoration facilities. We have also become widely known and respected for the building of Porsche for race and rally and providing race support at circuits around the UK. Involvement with the Porsche Club of Great Britain and charity fund raising has earned David Forrest lifetime Honorary Membership of the PCGB as well as high recognition for this outstanding contribution to Motorsport. Strasse charity work has included local childrens charities as well as Alzheimer’s and local hospital research. What Strasse has never done however is grown too big - almost all our customers are known by first name -keeping it personal is what we are about. Dave Forrest is at the helm. His family's automotive history goes back to his Grandfather having a garage in Bradford - before David was even a twinkle in anyone's eye. Now slightly older than a twinkle, he has spent nearly all his working life looking after, and looking at, all things Porsche. It’s true to say Porsche was his passion and dream since he was a lad and still is. He has been involved in motorsport - behind the wheel and sometimes under them and can often be found on the workshop floor getting his hands dirty, except on a Saturday when he uses his hands to hold his head while he follows his other lifelong passion of football. David's true love of all things Porsche makes him the ideal man to enthuse over cars (ours or yours.) When it comes to each model's little quirks, in true Yorkshire fashion he is the man to tell it like it is. Also joining Dave is another Forrest, Sam is to be found in service reception and sales. A chip off the old block as they say, with as much Porsche passion as the rest of the family. Dave 'The Legend' Sunderland – what can we say? There can be no substitute for experience and there is no substitute for this man. Dave has been living and breathing Porsche since becoming service manager at the original Official Porsche Centre for Yorkshire in 1968. 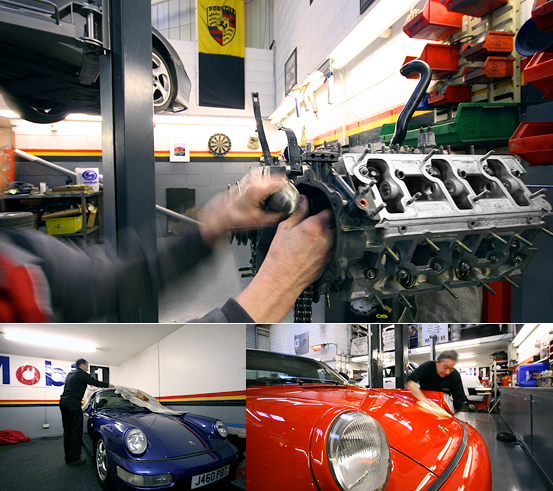 He cut his teeth (among other things) on 356s, early 911s and 912s, 964, 993 we could go on ….. he is still here in the workshop building engines and gearboxes there quite simply is nothing he hasn’t seen or done where Porsche technical is concerned. He is indeed THE Legend. Dave's nickname, The Legend, is well deserved: he is still preparing race winning cars for the Porsche Cup and Classic Championship - and preparing cars that are a dream to drive. His vast knowledge of engines and gearboxes means he is constantly in demand. (Did you know that the '78 930 Turbo engine has a bigger flywheel seal than the'77 model, or that a 993 Turbo has sodium-cooled exhaust valves?! Well you do now…) He doesn’t need Google either …. Other members of the technical team include Chris Dyer, Ryan Morton, David Goddard, and Luke Howarth all vastly experienced and with Strasse for many years. Charlie Carter and Lindsay Dobby finish up the office team.